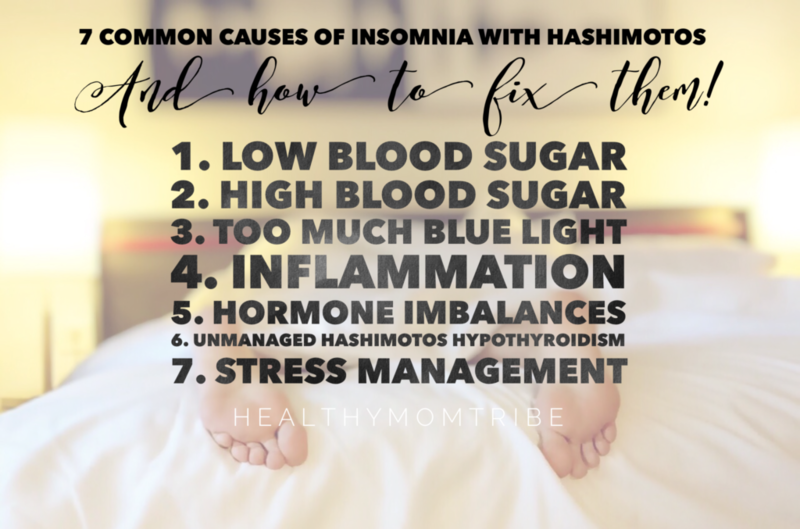 7 Common Causes of Insomnia with Hashimotos & How to Fix it! Tired during the day? If you have hypothyroidism, you’re more likely to experience fatigue, but getting better sleep can help boost your energy. For years I went on living “wired & tired” day in and day out with no relief in sight. I would caffeinate myself all day, then crash for 3-5 hours and wake exhausted. This made for a very unpleasant Mommy and an upset family. My business at the time suffered and so did my health, I was too tired to do anything never mind working out. Here are the most common REAL reasons you can’t sleep and some tips to get a goodnights sleep. hypoglycemia is one that is usually under looked with all the focus on high blood sugar. Have you ever waken up at 3 or 4 a.m., racked with anxiety and unable to fall back asleep? That could be caused by a blood sugar crash, which raises stress hormones (hence the anxious wake up). Eating small but frequent meals, never skipping meals, and avoid sugary and starchy foods are important to keep blood sugar stable. Additionally, eating a little bit of protein before bed and at night if you wake up may help. Do you fall asleep after meals yet struggle to fall asleep at night? Do you wake up feeling like you’ve been run over by a truck, but are wide awake at bedtime? It could be high blood sugar, a precursor to diabetes, is driving your primary stress hormone cortisol and keeping you up. A telltale symptom of high blood sugar is falling asleep after meals, especially starchy meals. Minimizing sugary and starchy foods, not overeating, and exercising regularly can help you rewind insulin resistance and sleep better at night. Blood sugar issues are very common among people with Hashimoto’s hypothyroidism. Are you staring into a computer, phone, tablet, or TV screen right before bed? If so, you’re confusing your body’s sleep hormone production. The body recognizes blue light as daylight, which suppresses the production of melatonin, our main sleep hormone. Limiting your exposure to blue light at night can help boost your body’s production of sleep hormones. Turn everything off two hours before bed, and limit your evening screen time to boost melatonin. ALERT=>If you are not managing the autoimmune mechanism of your Hashimoto’s hypothyroidism, inflammation is going to be an ongoing issue. Hormone imbalances can significantly impact sleep. Low progesterone, which is a common symptom of chronic stress, heightens anxiety and sleeplessness. An estrogen deficiency in perimenopause and menopause has been shown to increase anxiety, insomnia and sleep apnea. Also, low hormone levels can be inflammatory to the brain and increase anxiety and insomnia see #4. Get your levels checked every time you get thyroid labs rechecked and talk with your doctor about possible hormone therapy until you can regulate this issue through diet and exercise. If you are not working to manage the autoimmune component of your Hashimoto’s hypothyroidism, thyroid flares may be damaging the thyroid gland and spilling excess thyroid hormone into the bloodstream. This can cause nervousness, anxiety, and insomnia. It’s important to manage your immune system when you have Hashimoto’s. First address the autoimmune triggers!! Low Dose Naltrexone has been a helpful tool for many with elevated thyroid antibodies as well as helping to regulate sleep cycle, speak with your functional MD about this. One of the biggest contributors to sleep problems is stress (this goes for all humans! ), and people tend to think about stressful situations instead of closing their eyes when they climb into bed. To address these issues in a beneficial way, try writing in a journal or practicing relaxation techniques like meditation. If you would like more help with how to get better at managing your daily stress in just 10 days, check out my mini program!